What a busy and wonderful week it has been. From our football teams who went to Guangzhou last weekend to compete in the NAESCA Cup U14 Football Tournament (great results by the way) through to us successfully donating 426 boxes to the Box of Hope charity - fantastic. Thank you to each and every one of you who donated and also to the parents and teachers who accompanied our football teams to China. Wednesday was our amazing International Day which saw a kaleidoscope of colours, foods, dress and cultures celebrating the schools multicultural and diverse mix. Next came a visit from local artist Elaine Chiu who ran a watercolour painting workshop with our Y9 pupils to develop their understanding of two-point perspective and watercolour painting techniques by taking part in this workshop. And today we welcomed Pilot Tim Grevis-James into several classes as part of our Greener Skies challenge and he spent time talking to students and answering their many questions. We also celebrated coming top out of the school in Hong Kong in the Language Perfect competition – well done to every student who took part to make this happen. Next week looks equally as exciting, with Monday being World Children’s Day. 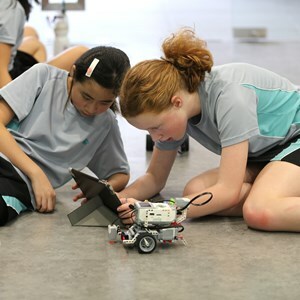 It is also the launch of our STEAM week running at our Sai King and Tai Tam campuses. Finally, don’t forget that next Friday is Gender Equality Day, and a non-uniform day where we’d like everyone to wear something red to match the Global Goal #5 logo. On Monday, 20 November, our students will join with other young people globally to celebrate World Children’s Day by raising their voices in solidarity with some of the most vulnerable children in the world. An important aspect of World Children’s Day is that we listen to and empower young people. Our students are passionate about making a real difference and we believe that with our support now, our students can have a significant impact on the world for decades to come. You can follow the action live through our UNICEF social hub. We are currently reviewing all the applicants for the next academic year (2018/2019). As you know siblings have a priority and we want to make sure that the siblings of our current students and families have submitted their applications. If you have not done this as yet please contact admissions@nais.hk by Friday the 24th November 2017. Friday, 24 November is a non-uniform day when students should wear red (to match the Gender Equality logo). Our Student Council from the Lam Tin campus will visit our Sai Kung and Tai Tam campuses will read and discuss books that promote Gender Equality with EYFS children. (Monday 27th Sai Kung and Thursday 30th Tai Tam). We will be holding a Parents’ Evening on Tuesday 21st November between 3:00pm and 6:00pm, and Thursday 23rd November between 4:30pm and 7:30pm. We had another wonderfully successful celebration of our culturally diverse school. Thank you to everyone for their hard work, time and effort for making this such a great day. Everyone enjoyed themselves and the students had a blast learning all about the different countries, playing games, tasting foods and seeing the traditional dress of countries around the world. We are so proud of being a truly international school and educating our children to respect themselves and to know that different doesn’t mean bad. Watch the video of each country introducing themselves here. User Guide and Service Details are available here for easy reference. For queries, please contact us by email cs@schoolmaster.hk or by phone 2880-5000. It’s time to check out what’s for lunch next month and to place your orders. You can view the menu here. Please read important information about the Primary sports day here. Please be reminded that, as per the original dates advertised on the sign-up forms, there will be no after school ECA’s from Monday 20th – Friday 24th November. This is due to staff hosting parents’ evenings and not being available to run the ECAs. Please note the daily swimming sessions for the swimming squad WILL still take place here at NAIS from 7.00am -7.45am. Our first Lego league team are working on a project entitled Hydro Dynamics which is all about the human water cycle and as part of the challenge they need to come up with a product to improve the way humans use water. We have an idea and now want to share it with someone from the industry and get feedback. Sound interesting? Contact Mr Darren Sutton here. There was an U10 football tournament hosted at HKFC on Wednesday afternoon and we sent two boys teams and one girls team to take part. Congratulation to the Boys B team who won their competition! The Boys A and Girls teams also produced some pleasing football and showing really good progress so far. Great news … we have recently been granted the status of candidate school by the IBO. This means that we are one step closer to being uniquely identified as an authorised IB World School. Teachers are currently registering on IB specific training so as to teach and assess their students according to IB rigorous requirements. You can read an IB Diploma student’s success story here. Fantastic assembly today in which 1A spoke and sang all about penguins, where they live, how they breed and many other incredible facts. It was such an interesting topic and what amazed us, was the way they all spoke so confidently spoke in front of such a large audience. Well done 1A, you should be really proud of yourselves. Today Mr Bishop delivered the assembly to Secondary pupils on the issue and importance of being resilient in order to achieve success in our lives. He asked pupils to think of examples of how people can demonstrate mental, physical and emotional resilience during challenging times and gave 10 Top Tips to pupils on how they can do this themselves. He ended the assembly with a video showing an example of resilience as shown by Diego Hypolito, a Brazilian gymnast who failed to medal in both the 2008 and 2012 Olympic Games but still managed to bounce back to claim silver in 2016. Please follow this link of the video shown in assembly today. With only four weeks to go until our fabulous Christmas Concert, we would ask all parents to save the date and encourage all students to practice at home. Choir words, orchestra music and string ensemble music are available on Firefly! This week has revolved around our International Day and all the countries our pupils represent. It has been a truly exceptional first International day in Tai Tam and one which has been very enjoyable and informative for everyone. We started the event with our children and staff fashion parade – representing over 15 countries around the world. Next year we will invite parents to participate so please start planning your costumes now! Thank you so much to all our volunteers, the children had an amazing day learning about all the different countries and nationalities – baking, creating, dancing and singing their way from country to country within our school community. We also made handprints which we have shared with Lam Tin and the hands of all our children across the three sites are displayed in the Maker Space in Lam Tin. We have shared the photos of this with our children. I look forward to welcoming many of you to our Information session about Tapestry our online learning journal next Thursday. Please can you start collecting boxes and send them into school on 20th, 21st and 22nd of November. Sarah Williams in Year 1 will be coordinating our MIT work from Tai Tam, so please feel free to contact her if you have any questions or want to support in any way. This information session about our online learning journal that will give parents an opportunity to see how their child is developing through the year. 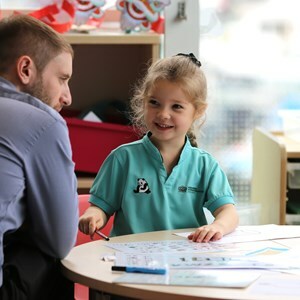 It will also give you an opportunity to spend time with your child in their classrooms as they show you some of their learning and a chance to meet other parents. We will end with a parent coffee and cake morning. Friday, 24 November is a non-uniform day when students should wear red (to match the Gender Equality logo). Our Student Council from the Lam Tin campus will visit Tai Tam on Thursday, 30 November to read and discuss books that promote Gender Equality to EYFS children. Please ensure that you have made an appointment with your class teacher and Ms Li, our Mandarin teacher, to discuss the progress and development of your child. 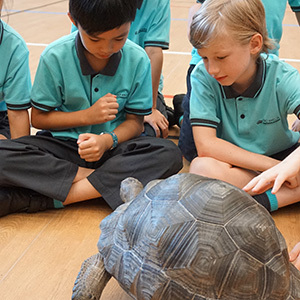 “My classroom is one where I work very hard to create learning opportunities that pique the children’s curiosity and drive them to want to find out more. I encourage the children to take risks and feel confident to give all experiences a try, ensuring they know they are fully supported and cared for. I like to create a warm, friendly and inclusive classroom where all the children’s learning and achievements are celebrated. Year 1 children will join in the whole of Primary Sports Day on Friday, 1 December. Please ensure that you let your class teacher and taitambus@nais.hk know what transport option you are choosing on this day. EYFS will have a separate sports day with Sai Kung EYFS in the Spring. More information will be given about both events nearer the time. Save the date for our Tai Tam show on Tuesday, 12 December at 10am– all the children will take to the stage and parents will be invited. This week you should have received a note home about costumes and your child’s line. It is time to get into the festive spirt and don those fabulous Christmas jumpers we all love (to hate sometimes)! On this day we will be celebrating Christmas by asking all our children and staff to wear Christmas jumpers. We will also have our Christmas parties on this day. We are a ‘nut free school’ as we have a number of children with severe nut allergies. This includes peanuts and tree nuts. Please remember this when packing your child’s snack and lunch. We cannot allow nut/nut products of any kind in the building. For a snack we suggest a small piece of fruit or bread. It’s the end of another exciting week in Sai Kung as we have been celebrating our diverse pupil body through International Week. We have been visited by our lovely parents who have arranged a host of exciting activities for the children to help them learn about the different places our families come from. We have visited Norway, India, China, Japan, Hong Kong and Canada to name just a few. The parents came in with props, flags, cooking equipment, stories and lots and lots of enthusiasm. It was really special to have so many visitors and all the children got so much from each session. 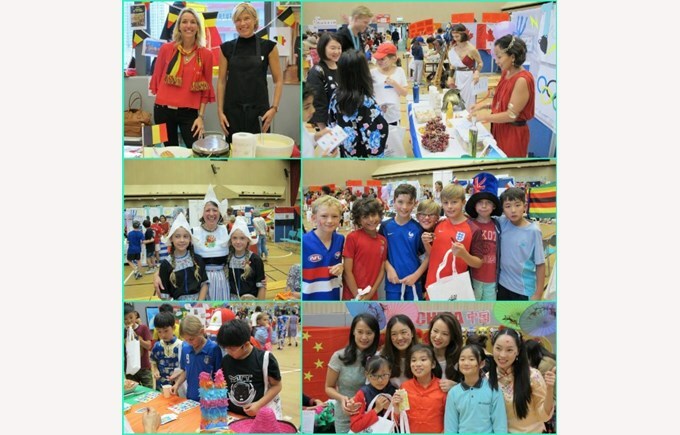 On Wednesday, all three campuses came dressed in the colours and traditional costumes of their countries and here in Sai Kung we spent a special day visiting different classrooms and joining in lessons prepared by all our teachers to celebrate a host of countries. All the children have spoken about how much fun they have had and how much they have learnt. A special thank you to all the parents and Mrs Coleman, for organizing such a dynamic week. This weekend the teachers will be again working hard to create something special to launch our STEAM week, next week. Don’t tell the children, but we will be turning the school into an airport departure lounge and Captain Cooklin and one of our Cathay Pilot parents will be on hand to fly us all somewhere exciting to mark the start of our exploration of ‘the future of flight’. With the aid of a flight simulation and some dramatic techniques we aim to inspire them and light a spark to get their interests up for the week ahead. I will tell you all about how it goes next week. Don’t forget to send us in your junk on Monday and Tuesday so we are ready for the big House challenge on Wednesday, where the children will be working in teams to create giant planes. You should have all received information about our Tapestry information session (EYFS parents) and our ‘Drinks under the Stars’ from the PTA. We hope to see you all there so please do sign up. Our first PTA event will be held at Sai Kung on the roof. We will have a session on ‘Tapestry’ which is our online assessment system for early years followed by a drinks evening for parents. Please save the date in your diaries. As part of our MIT collaboration we will take part in our first STEAM challenge of the year, which is called ‘Greener Skies’. We will launch this project on Monday, 20 November which will then start a whole STEAM week, where the children will be imagining what the future of flight will look like. On Wednesday, the children will take part in a House challenge to build a giant plane. We need your help for this. Please can you start collecting boxes that then need to be sent into school on 20, 21 and 22 of November. Eliza Man in Year 1 will be coordinating our MIT work from Sai Kung, so please feel free to contact her if you have any questions or want to support in any way. We will be looking at all things to do with flying including, animals, parasailing, rockets and planes. So, if anyone has any connections to these areas, please let us know. Friday, 24 November is a non-uniform day when students should wear red (to match the Gender Equality logo). Our Student Council from the Lam Tin campus will visit our Sai Kung Monday 27 November, to read and discuss books that promote Gender Equality to EYFS children. 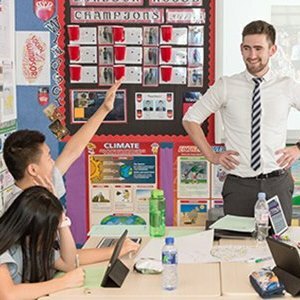 After spending 9 months language teaching in Bangkok I felt inspired to develop my teaching career further. Once I graduated with my PGCE, I taught in the U.K before joining the Nord Anglia family at the British International School of Chicago. In my classroom I aim to create an environment where children are excited about their learning, challenge themselves and feel confident enough to take risks. In my role as Innovation and Entrepreneurship Leader I have enjoyed introducing opportunities for children to problem solve creatively and develop their business acumen, and this is something that I hope to continue in Hong Kong. I have been privileged to spend a week at the Massachusetts Institute of Technology as part of Nord Anglia’s collaboration with MIT. The experience was eye opening and spurred me on to continue my work integrating STEAM education into the curriculum. Outside of school I lead a very active lifestyle – I particularly enjoy boxing, running and taking part in social sports leagues. I am passionate about travel as it gives me the opportunity to visit incredible places and experience new cultures. If your child is in Year 1, you should have already received information about a suitable appointment form Miss Man. You will also be able to meet with Miss Lo about Mandarin at this time. Year 1 children will join in the whole of Primary Sports Day on December 1. The letter with information about this will go home in your child’s book bag. Please let us know about your transportation plans. Save the date for our Sai Kung show – all the children will take to the stage and parents will be invited. More details will follow.